A number of the SystemTap script examples in the newly released SystemTap 4.0 available in Fedora 28 and 29 have reduced the amount of time required to convert the scripts into running instrumentation by using the syscall_any tapset. The key observation that triggered the creation of the syscall_any tapset was a number of scripts that did not use the syscall arguments. The scripts often used syscall. * and syscall. *.return, but they were only concerned with the particular syscall name and the return value. This type of information for all the system calls is available from the sys_entry and sys_exit kernel tracepoints. Thus, rather than creating hundreds of kprobes for each of the individual functions implementing the various system calls, there are just a couple of tracepoints being used in their place. Let’s take a concrete look at the impact of using syscall_any. *.return in place of syscall. *.return with the errno.stp example on a Fedora 28 machine. This errno.stp script provides system-wide information about the system calls that return error codes. It prints a separate line for each combination of PID, system call, and error. At the end of each line is a count of the times that particular combination was seen. Below is a version of the script using syscall.*.return. # Copyright (C) 2010, 2018 Red Hat, Inc.
# By Dominic Duval, Red Hat Inc.
# Monitors errors returned by system calls. We can use the stap_time.stp script discussed in my previous SystemTap article to record the time required by the various SystemTap phases. The stap_time.stp script will be running in another window. Below is a run of the old_errorno.stp script that instruments the system calls with the syscall. *.return probe points. The command line has -m old_error to keep the resulting kernel module old_errno.ko around, the keep temporary files (-k) option so we can look at the size of the files used to create the instrumentation, and -T 0.25 to run the instrumentation for a quarter second. With some minor work, Gnuplot can generate a graph of the data, as seen below. 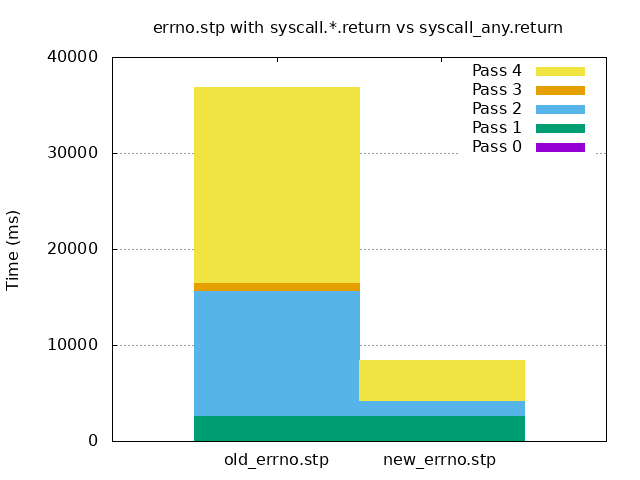 Pass 2 (elaboration) and pass 4 (compilation) are the ones that take a majority of the time in old_errno.stp using the syscall. *.return probe points. We see those are greatly reduced in new_errno.stp using the syscall_any.return probe point: from 13,033 ms to 1,593 ms for pass 2 and from 20,384 ms to 4,125 ms for pass 4. We also see pass 3 code generation is virtually nonexistent on the graph (reduced from 807 ms to 22 ms). Looking at the *src.c files in the temporary directories /tmp/stapUfJ9KC/ and /tmp/staprI6U1R/, we can see that old_errno_src.c is about four times larger than new_errno_src.c. This explains the additional overhead for the pass 3 code generation and pass 4 compilation and the larger old_errno.ko. If your SystemTap script just requires information about the system call name and return value for all the system calls, you should consider using the syscall_any tapset in place of the syscall. * to make the instrumentation compile faster and result in small instrumentation. Red Hat Developer has many other articles on SystemTap and performance. The post Reducing the startup overhead of SystemTap monitoring scripts with syscall_any tapset appeared first on RHD Blog. Original article title: RHEL Developer: Reducing the startup overhead of SystemTap monitoring scripts with syscall_any tapset. This full article can be read at: RHEL Developer: Reducing the startup overhead of SystemTap monitoring scripts with syscall_any tapset. mythcat: Fedora 25: First test with clamav antivirus.